Lois and Gerry Poplack's z"l family histories reach back to the Jewish communities of Latvia, Lithuania and the region then known as the Austro-Hungarian empire. From these distant parts of the world, their families brought to Portland the Jewish traditions of lighting the Sabbath candles and sharing Passover Seders and joyous Hanukkah celebrations. "Like my parents in their time, I've always been involved in Jewish life in Portland. My father was the president of the board of directors at Cedar Sinai Park, and I attended the religious school at Congregation Beth Israel," Lois shared with OJCF back in 2010. "We viewed Temple and Cedar Sinai as two especially important organizations and we were fortunate to be able to help contribute to their good work. Giving to our Jewish community was just part of our family life." 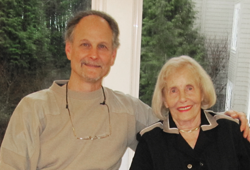 When Lois and her children, Jim (pictured above), Rick and Jan talked about these connections to the community and the continued desire to donate funds, they realized a charitable gift annuity (CGA) would be a good fit for them and they contacted OJCF. Lois' charitable gift annuity created fixed income for life for her, provided a tax deduction at the time of the gift and now that she has passed, created an endowment for the benefit of Cedar Sinai Park, Congregation Beth Israel and OJCF's Community Endowment Fund.